This is just a quick guide for those of you that want to play with Kodi v18's new feature, Retroplayer. Retroplayer is a new player core for Kodi. It is similar to the video and audio players, but it plays games instead of movies and music. The players, or more specifically called game emulator addons, are the same game emulators available for libretro. Note that I'm in no way affiliated with Kodi, I just like to tinker. There's another guide out there, but it was specific to the development branch of Kodi prior to official release. I will try and update this post from time to time with relevant info. Also note that a lot of this stuff is in the Kodi Wiki, which is still being updated for Retroplayer specific stuff, so check there for help as well. 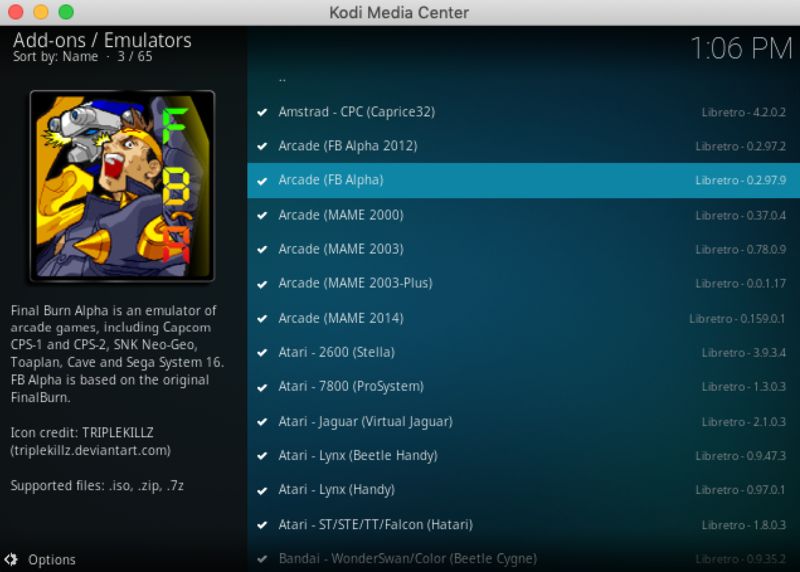 Game emulator addons are available in the Kodi repository for Windows, OSX, Android and LibreElec users. You will see a listing of available game addon emulators for your system. You will need at least one emulator for each system you're interested in playing. Note that all game addons are not available for all OS's / systems (Android systems have different addons available than Windows for example), and the list is changing regularly (just like the available emulators for libretro changes regularly). Each game addon typically has a number of settings that can be tweaked. The settings should be exactly the same as those for the libretro equivalent emulator. Information on the individual settings can be found on the libretro wiki core documentation. Once you've installed game emulator addons, now you need game files to play a game. Note that linking to game files is not condoned in general on the internet, so no one in this forum can help you find a particular game you're looking for. Use google. Kodi v18.0 does not have any library functionality for games yet (that is coming in a later version). 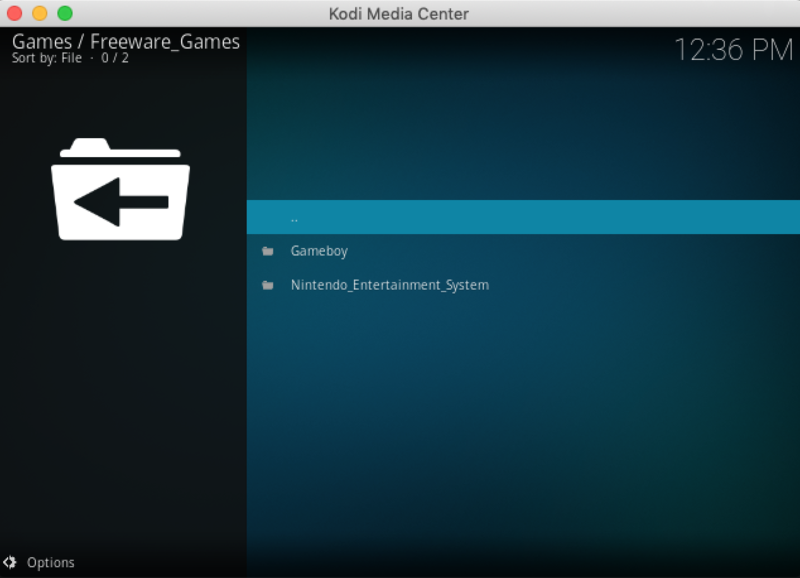 At this point, you're only able to browse games via a file manager interface in the Kodi core application. If you want to create a library for your games, you can use one of the many game or program addons available to provide that. Check the Game Addon and Program Addon forums for options. - Choose your folder containing your game files. In the example below, I'm choosing a folder that I downloaded some freeware game files from libretro. - Now you've got an added source containing your game files. Now that you've got a source added, it's as easy as browsing to the file you want to play. If you've got multiple game emulator addons that will play the file, you will be prompted to choose which you want to use. There are several game emulator addons that require BIOS files to function. BIOS files are typically (but not always) proprietary code taken directly from the game hardware that support the Basic Input and Output of that System. Just like game files, linking to BIOS files is not condoned in general on the internet, so no one in this forum can help you find a particular file you're looking for. Use google (suggest searching for the BIOS files CRC signature). A list of required BIOS files for each game emulator addon can be found in the libretro wiki for each core. If you want to get more specific information, you can look at these info files, which detail the filenames and crc signatures for each file. Similarly ISO, BIN, IMG, CUE files are also playable in some game emulator addons (such as PSX, Saturn, Reicast, etc). You can safely add these as non-video extensions if you know your video files are not of these format. Not sure step 7a is necessary -- at least not with regard to zip files. I added my NES rom folder, browsed through it to find my game, clicked on the game (Game.zip; all my roms are zipped), and Kodi then showed me a list files in that zip file (In this example it was Gun.Smoke.nes). I clicked it and it asked which emulator/add-on to use. I chose the Nestopia core and it ran. (2019-02-18, 22:33)ewookie Wrote: Not sure step 7a is necessary -- at least not with regard to zip files. I added my NES rom folder, browsed through it to find my game, clicked on the game (Game.zip; all my roms are zipped), and Kodi then showed me a list files in that zip file (In this example it was Gun.Smoke.nes). I clicked it and it asked which emulator/add-on to use. I chose the Nestopia core and it ran. It is only necessary to play zip files for MAME, MESS, FBA. Similarly, other cores like PSX, Reicast, etc look for bin/cue and or iso files. If they're not removed as video playable files, then they will default to attempt to be played as a video. I've updated the first post to clarify. Thanks, Zach. You may also want to mention that the advancedsettings.xml has to be created manually in the 'userdata' folder. I haven't had to mess with that file since the xbox0 days! Couldn't find it so I googled and refreshed my memory. I'd prefer not to use RCB or AEL addons to keep things lean and easy for me. Instead, I'd like to add two folders of games: one with SNES roms, one with Genesis roms. I am using Kodi 18.1 on Shield TV. * Is it possible that I manually add posters and fanart files adjacent to the rom and this gets displayed. How to name them? * Can I set a default emulator for each folder or file? * Atari 2600, C64 and Amiga emulators seem to be missing? At least for Shield TV? Am I missing anything and can I add them manually to retroplayer? (2019-03-24, 02:09)steve1977 Wrote: * Is it possible that I manually add posters and fanart files adjacent to the rom and this gets displayed. How to name them? Sorry, haven't implemented poster/fanart support in the Games library. Only add-ons provide artwork ATM. (2019-03-24, 02:09)steve1977 Wrote: * Can I set a default emulator for each folder or file? Sorry again, setting a default emulator isn't implemented yet either. The reason is because we need a way to store these per-game or per-folder preferences, which requires a database of some sort. 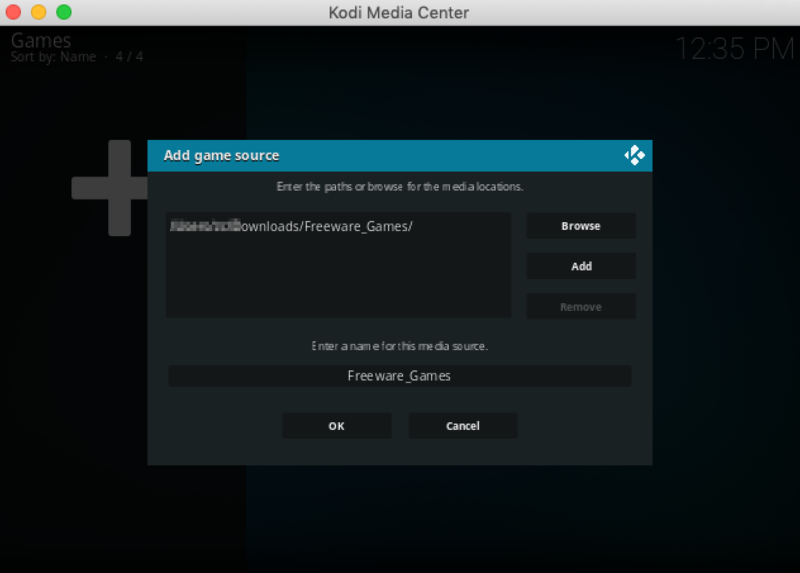 Kodi's database code is in poor shape (I've written two game databases and had to abandon both). Work is in progress to renovate our database layer, so someday this will be possible. (2019-03-24, 02:09)steve1977 Wrote: * Atari 2600, C64 and Amiga emulators seem to be missing? At least for Shield TV? Am I missing anything and can I add them manually to retroplayer? I haven't checked recently, but it's possible that compilation for Android 64-bit has broken and the emulators may need to be patched. (2019-03-24, 02:09)steve1977 Wrote: I'd prefer not to use RCB or AEL addons to keep things lean and easy for me. Can you please elaborate why RCB or AEL do not keep things "lean and easy"? Any feedback you can give me may help the development of future AEL versions. Apologies if my note came across wrongly. I am hugely appreciative what you and other developers are doing in terms of addons and more broadly. No specific issue arond RCB or AEL. It's great the addons exist and seem well maintained with larger group of loyal fans. Let me elaborate though what led to my comment: in general, I prefer a native implementation for something that should be the very core of Kodi such as the library function. Besides that, I prefer to keep all artwork local together with my files (NFO, poster.jpg and fanart.jpg together in my folder). This allows me to add the library to another Kodi device or allow me to rebuild a library within seconds. Also, I prefer clean views and poster and maybe fanart seems sufficient to me. Best way to describe it that Aeon seems to be the most loved skin with many mods and deviates. I still prefer Estuary for its cleanliness and not using too many extra artwork beyond the core. That's how tastes are different. (2019-04-02, 15:29)steve1977 Wrote: Apologies if my note came across wrongly. I am hugely appreciative what you and other developers are doing in terms of addons and more broadly. No specific issue arond RCB or AEL. It's great the addons exist and seem well maintained with larger group of loyal fans. No offense taken, so no need to apologise. I am genuinely curious about what you think about this matter. 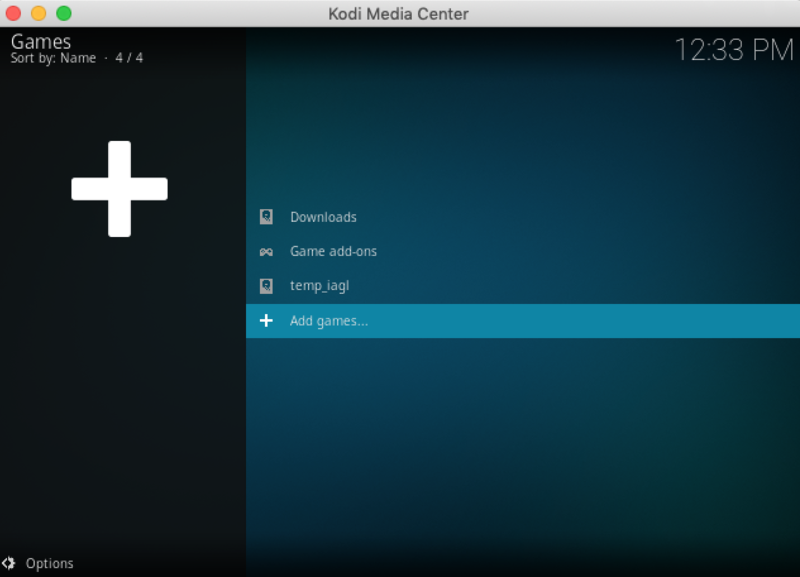 (2019-04-02, 15:29)steve1977 Wrote: Let me elaborate though what led to my comment: in general, I prefer a native implementation for something that should be the very core of Kodi such as the library function. Besides that, I prefer to keep all artwork local together with my files (NFO, poster.jpg and fanart.jpg together in my folder). This allows me to add the library to another Kodi device or allow me to rebuild a library within seconds. Also, I prefer clean views and poster and maybe fanart seems sufficient to me. Thanks for sharing your opinion. First, having some functionality into Kodi core does not necessarily mean it's better. For example, a lot of functionality in Kodi Leia that was previously into the core have been moved to new binary addons. I agree with you that having the library into the core allows you to share the library among several devices, if you use a remote database server. Talking about games (or ROMs), generally it is a bad idea to have the Icon, Poster and Fanart in the same folder as the ROMs. There are tons of reasons for this. In my opinion the most important one is that the artwork is named with the same filename as the ROMs. This is the non-written agreement in the emulation community and if Kodi doesn't follow it in the future games database it would be a tremendous mistake in my opinion. If artwork is named as the ROMs, it cannot coexist in the same folder as the ROMs because of filename collision. For example, have a look at the Libretro Thumbnail collection. Here, the artwork for different systems is organised into category directories (named Boxarts, Titles and Snaps) and there is a directory for each platform. AEL follows this convention, with the addition that AEL supports not only these three types of artwork but some additional ones. Also, note that Icon, Poster and Fanart are media center artwork types created for Movies, TV Shows and Music. However, games (ROMs) are completely different. Most games (99%) do not have Fanart. Usually only arcade/MAME ROMs have a Poster (named Flyer). The approach AEL follows is to define a set of standard games artwork types: Boxfront, Boxback, Titles, Snaps, Flyers, Clearlogos, etc. and then map these standard types to Kodi types: Icon, Fanart, Poster, Banner and Clearlogo. Note that the user can change the default mapping on a per-launcher basis but the defaults should be fine (and also the skin designer should expect a more or less unified artwork mapping to Kodi default asset types). I designed this approach after a lot of thinking and I expect that Kodi will do something similar when the games DB is implemented. Finally, you can create the NFO files with AEL using the information of the offline scraper (a games database included with AEL, still in development but working very well for some platforms). AEL is able to scan a launcher having thousands of ROMs, including the NFO files and artwork, in a matter of seconds. Also, the Launcher configuration can be exported to an XML file, so if you need to rebuild your setup from scratch you can be done in a matter of minutes (much less than a minute per launcher in your config). By the way, another difference between Movies/Music and Games is the size of the collections. I guess not so many users have more than 100 Movies, maybe a few will have 1,000 movies. However, in Games it is normal to have full No-Intro collections (about 40,000 ROMs in total for all platforms). A full MAME collection contains 140,000 games in total (40,000 MAME machines plus about 100,000 Software List items). I am telling all this to make the point that what works for Movies/Music may not necessarily work for Games, for things as simple as the sheer numbers. (2019-04-02, 15:29)steve1977 Wrote: Best way to describe it that Aeon seems to be the most loved skin with many mods and deviates. I still prefer Estuary for its cleanliness and not using too many extra artwork beyond the core. That's how tastes are different. Talking about skins, everybody has his preferences. I also like Estuary for its cleanliness. However, there are other simple and elegant skins, for example Lyrebird by Rufoo or Aura by Jurialmunkey. The skin I provide in the AEL thread, named Estuary AEL, is just a test skin to demonstrate AEL's capabilities and I admit that the views are a little bit overloaded with artwork. That's on purpose to test AEL! However, Game views on Lyrebird are much more refined and use less artwork per-view, for example, Clearlogo, Title, Snap and Boxfront. Thanks for taking the time to share with me. I'll definitely give AEL a try over the weekend. I may not be able to use the offline scraper due to limited space on my Nvidia Shield TV. I have Kodi also on other OS, but the Shield is the device I'd like to use for emulator games. One use case is different for me that I prefer not to have as many emulator games in my library. I actually prefer to have just a few for each console (much less than I have movies). And to be more precise, just the ones that I own. That's personal choice obviously and maybe exception rather than rule. To clarify: I love different skins and Transparency! was my preference for many years. Just named Aeon as an example of a skin that feels similar to AEL to me (many many different artwork all across the screen), which seems to meet general taste (Aeon is hugely successful with tons of mods with even more artwork), while a simple box cover may be more to my taste profile. I also bought Bigbox, which you may know? Same issue that its GUI is not "light & clean" enough for my taste, but highly popular. Let me give it a try over the weekend. As long as I can over-come Shield's space limitation somehow, I can develop my own view rather than just commenting on something, of which I've seen screenshots and comments. Hi gays! 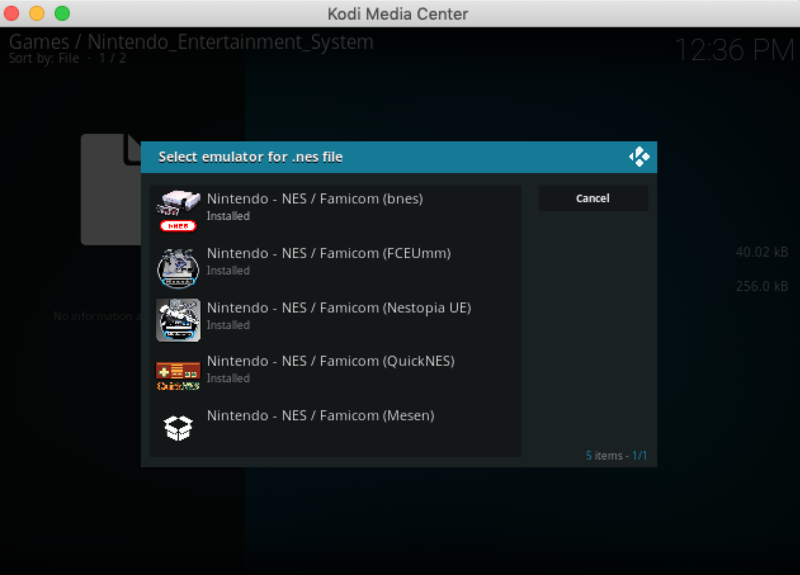 My be there is any solution with "Game emulator addons" on raspberry Pi2 with raspbian + KODI 18 onboard? I also want to install this game but during installation, it shows an error iTunes sync error 54, I really have no idea why this happens so I want a proper solution how to install this game without facing any error. This is not a game. It is a platform for emulators of many different game systems. What exactly are you trying to achieve?